Try these expert tips and Mom hacks to keep baby cool this summer! Summer is coming, the kids will be out of school and we are all planning vacations, picnics in the park, and beach trips. This is all great fun for the older kids but when you have a newborn or young baby along for the ride, it’s hard to know just how to keep them comfortable when the temperatures rise. 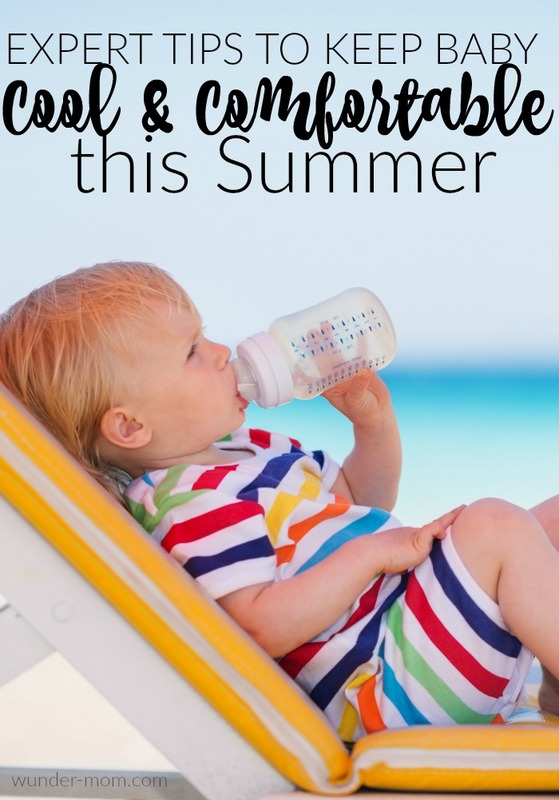 You want to be able to explore and adventure this summer with the family but you also want to make sure you can keep your baby safe in the heat. Strollers are a popular way to transport your little ones when you are out and about, but in the summer months there are some special considerations to use, such as not covering the the stroller with a blanket. It might seem like a good idea to keep the sun off of them and shade the baby, but in reality it can be quite dangerous. My youngest child was born in August, just in time for our regions hottest summer months. Being the youngest of four, though, I needed to be able to take her out with the older kids but still manage to keep her cool and comfortable. There are some excellent products and mom hacks that can help you manage the heat with baby in tow. Keep the air circulating under the stroller canopy with a stroller fan. It is battery operated, clips on, and is made with soft foam fan blades making it completely safe to use with infants. I kept ours on the stroller at all times, even for quick walks in the neighborhood. A plush animal with a gel icepack inside you’re used to seeing used for baby’s bumps and bruises but they can also double as a trick to keep them cool. Freeze the insert just as you would for an ouchie and take the buddy along with you in the stroller. These cooling towels are great for adults and older children to wear around their neck when the temperatures rise but they’re also a great tool for the babes. Dip them in water and wrap around the ankle to help keep them cool. Using a proper stroller sunshade will keep the sun off of baby while allowing air to flow through the breathable material. Tove from Mama in the Now has a child that is heat intolerant. 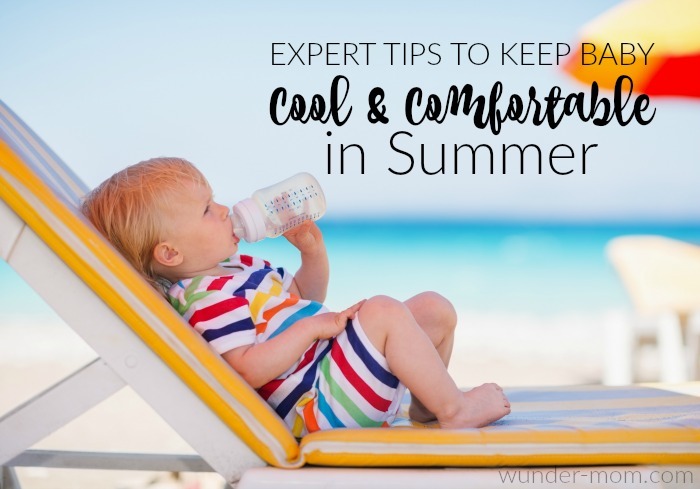 She recommends freezing water bottles ahead of time (the ice will melt and the water will be cool when ready to drink), wearing dry-fit style clothing to wick away sweat and putting baby in light colors. For a child with extreme heat intolerance they actually make cooling vests to wear! If you are visiting the beach, Megan from Playground Parkbench recommends bringing along a pop up umbrella sun shade to keep baby out of the UV rays. This provides a great picnic spot too! When we visit the beach I always like to bring along a small inflatable pool, as well. The babies don’t generally like the ocean water and the inflatable pool can be filled with a small amount of fresh water and placed under a sun shade – allowing baby a place to splash in the water and remain cool at the same time! We try to keep the little ones out of the sun and shaded as much as possible but when they are in the sun we want to make sure their skin is protected. There are options for UV protecting apparel and sunsuits and you always want to make sure you choose a good, safe sunscreen. Kara from Karacarerro.com has some great tips on choosing a safe sunscreen for the family and the science behind why you would want to. Do you have tips to add? I’d love to hear them!